Small and medium sized reactors, SMRs, (according to IAEA, ‘small’ refers to reactors with power less than 300 MWe, and ‘medium’ with power less than 700 MWe) are considered as an attractive option for investment in nuclear power plants. SMRs may benefit from flexibility of investment, reduced upfront expenditure, enhanced safety, and easy integrationwith small sized grids. Large reactors on the other hand have been an attractive option due to the economy of scale. In this paper we focus on the economic impact of flexibility due to modular construction of SMRs. We demonstrate, using real option analysis, the value of sequential modular SMRs. Numerical results under different considerations of decision time, uncertainty in electricity prices, and constraints on the construction of units, are reported for a single large unit and for modular SMRs. Jain, S, Roelofs, F, & Oosterlee, C.W. (2013). 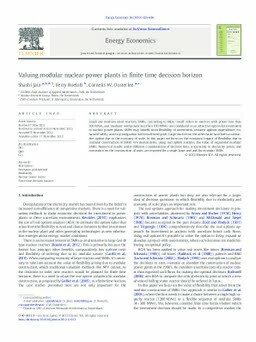 Valuing modular nuclear power plants in finite time decision horizon. Energy Economics, (36), 625–636.